We recognize our role in preserving natural resources and biodiversity while combating pollution and climate change. We’re committed to minimizing our main impacts on the environment through energy use, business travel and waste management. Energy usage: We have invested in upgrading the infrastructure of our buildings in order to improve their energy efficiency. We have implemented lighting, cooling, and heating to further increase efficiency. When making new real estate acquisitions, efficiency and sustainability certifications such as LEED are considered in the decision process, as is accessibility to mass-transit. We actively monitor our power consumption, implementing advanced energy saving measures such as high efficiency lighting and smart energy systems. Business travel: Business travel is an important area of focus for Capgemini in North America. While recognizing the critical importance of face-to-face contact with clients, our business travel and hotel stays contribute to our carbon footprint. We promote smart, safe travel through our North America Travel program. The NA Travel team facilitates the reduction of business travel and employee commuting emissions, ensuring that the right tools are in place for every employee to make informed, sustainable decisions when it comes to travel. Advances in video conferencing technology have radically changed the way businesses operate, reducing the need for time consuming and carbon intensive business travel. To enable a reduction in non-essential travel, we have implemented remote working and video conferencing technologies in all of our offices. Waste management: From refits to refurbishments, our business activities generate waste. We provide recycling facilities in our offices, and employ environmentally friendly disposal and electronic equipment recycling. We discourage unnecessary printing and photocopying. All electronic equipment is recycled according to local legislation. Our Environmental Policy sets out our environmental priorities. 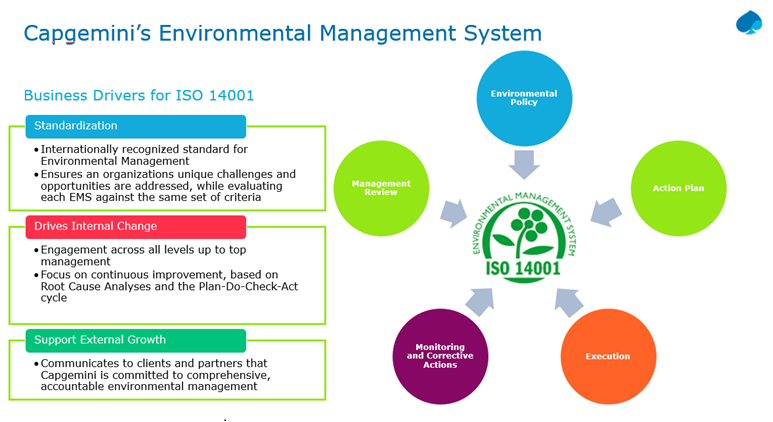 In 2016, we achieved ISO 14001 certification – the international standard for environmental management systems. Additionally, Capgemini upholds the principles of the UN Global Compact and is a signatory of the UN’s Caring for Climate program, which promotes environmental responsibility and environmentally friendly technologies.